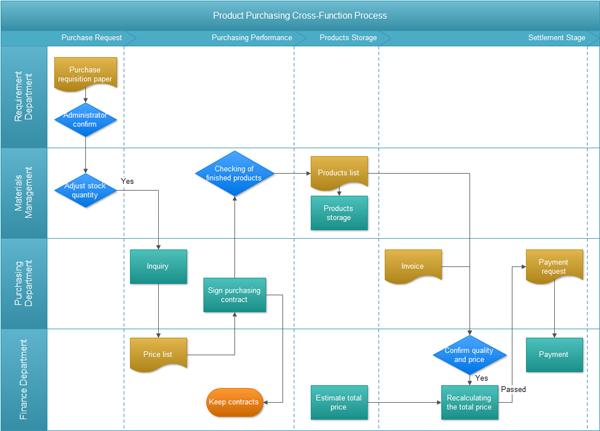 An example cross-functional flowchart, showing the product purchasing flowchart cross the different departments. The example presents a simple flowchart from purchase request, purchasing performance, product storage to settlement stage. The purchasing flowchart crosses the finance department, purchasing department, materials management and requirement department. You can also view more flowchart examples. Click here to free download Flowchart Software and view cross-functional flowchart examples. Then you can use the built-in templates to create and present your purchasing flowcharts in minutes.